This book explores one of the most illusive, mysterious, and misunderstood spiritual traditions in the modern world. It is the tradition, or more accurately, family of traditions subsumed under the term "esoteric." The number of phenomena covered by the term is enormous, for it encompasses not only explicitly esoteric works and movements but also components to be found widely in art, music, literature, politics, and science. On their own account, esotericists have often seen themselves as part of a tradition whose representatives include Moses, Zoroaster, Hermes Trismegistus, Plato, Orpheus, and the Sibylls; and whatever else this part mythic, part historic chain of tradition may mean, it suggests a long and variegated historical corpus. 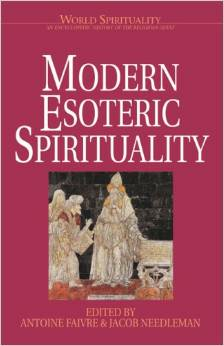 While attentive to the various ways in which esotericists have defined esotericism, this book approaches the subject phenomenologically, as an attitude of mind and as an ensemble of forms of spirituality with identifiable characteristics. After a rigorous attempt to define esotericism and sketch its broad contours in two separate Introductions, the first chapter offers a magisterial, 70-page study of the ancient and medieval roots of esotericism in Hellenistic, Jewish, Christian, and Arab sources. Then the body of the book focuses on the great esoteric currents in the modern West, that is, since the end of the fifteenth century. These currents include alchemy and astrology, Renaissance Kabbalah, Romantic natural science and philosophy, Rosicrucianism, Freemasonry, occultism, and theosophy as well as the ideas and schools associated with Paracelsus, Jacob Boehme, Rudolf Steiner, René Guénon, G. I. Gurdjieff, and C. G. Jung. As many of these terms and names suggest, esotericism is as vibrant and variegated today as it ever was, and may be seen not only in the explicitly esoteric traditions that form the subject of this work but in the reemergence of esoteric traditions within the various world religions as such—a consideration that is well outside the purview of this book but many be seen in other volumes in this series.